Wildflowers of Oregon and Washington East of the Cascade Mountains, Pacific Northwest Wildflowers Found East of the Cascade Mts. 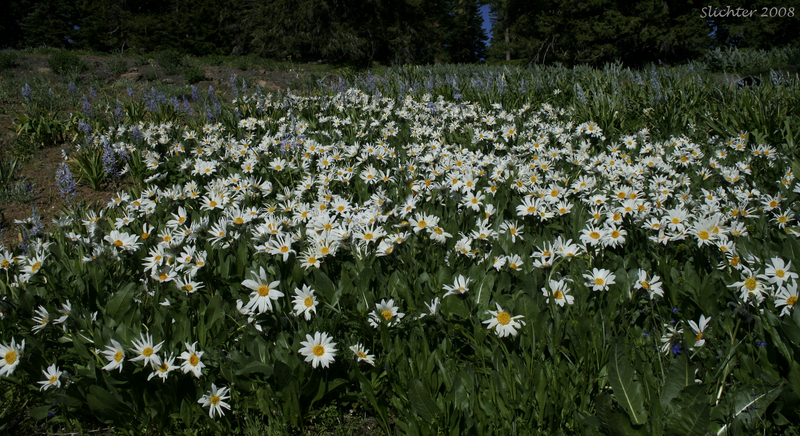 White Mule's Ears (Wyethia helianthoides) and Cusick's Camas (Camassia cusickii) as seen along the western rim of Hells Canyon in eastern Oregon............June 28, 2008. Larger flowers having petals in multiples of three (3, 6, 9). Larger flowers having 4 petals. Larger flowers having 5 petals. Larger flowers having numerous petals. An example is cacti. No small flowers are found in a central disk as in the sunflower family below. Flowers like sunflowers, daisies, or dandylions. Shrubs and Trees Found East of the Cascade Mts. Animals Found East of the Cascade Mts.